Power over Ethernet (PoE) equipment adds power along with data to Ethernet wiring so devices such as surveillance and card access machines can be powered via standard Ethernet cabling. 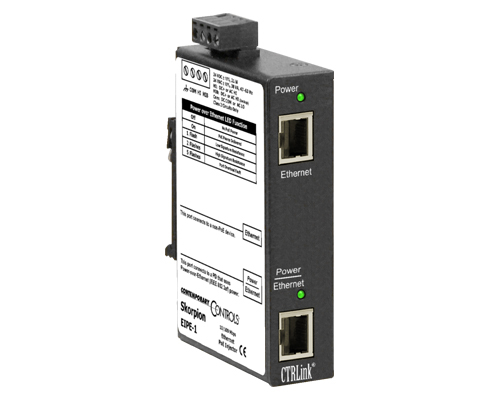 Power Sourcing Equipment (PSE) such as the Skorpion PoE Injector and Skorpion PoE Gigabit Switch provide the required 48VDC power onto the Ethernet cable while the Skorpion PoE Splitter extracts power from the Ethernet cable to power non-PoE compliant Powered Devices (PD). All PoE models support the IEEE 802.3af standard. Under certain circumstances a non-PoE compliant device can work with the use of the EIPE-2 splitter. 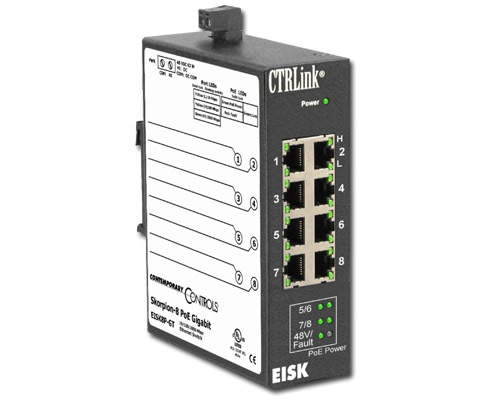 If the end device is 10/100 Mbps Ethernet-based but requires 24 VDC to operate, the splitter will accept the combined 48 VDC and data from a power sourcing equipment (PSE) and then internally generate 24 VDC to provide the non-PoE end device with separate data and power up to 10 W.
The EISK8P-GT gigabit switch within the Skorpion Series is an 8-port unmanaged Ethernet switch with Gigabit Ethernet (GigE) performance on all ports and PoE on four ports, supplying 15.4 W per PoE port. GigE jumbo frames up to 9216 bytes are supported for maximum system performance. 10/100 Mbps legacy devices are supported via auto-negotiation—accommodating any Ethernet automation system. This low-cost compact unit has a rugged metal enclosure and is intended for DIN-rail mounting in control panels. The unit is powered from 48 VDC and operates over 0 to 60°C temperature range. 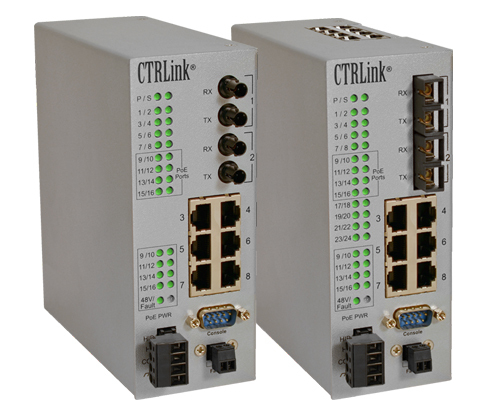 The EIDXMP Series of Ethernet switches provide management functionality in situations where extended temperatures of −40 to +75°C are expected. With a fixed width of 62 mm, these units offer 16 or 24 ports with copper and fiber/copper combinations. Ports 9 through 16 (located on the bottom of the unit) support Power over Ethernet (PoE), providing data and power over one cable. The unit acts as power sourcing equipment (PSE) supplying up to 15.4 W per port for IEEE 802.3af-compliant powered devices (PD). PDs can be located up to 100 meters from the switch. Models are available with either multimode (MM) or single-mode (SM) fiber optic ports to accommodate long distances through hostile environments. Fiber ports are fixed at 100Mbps data rate and use 100BASE-FX signaling at a wavelength of 1310nm. Available with panel or DIN-rail mounting, and 48 VDC powered.